The last little while I’ve been focused on (first-stage) edits and revisions of the moth guide. This book has provided me with an amazing insight into the publication process; I have a healthy respect for all the work that’s gone into the reference guides on my bookshelves, and deep sympathies for those other authors. It’s a lot more work than you’d think! We tend to take our books for granted, pulling them off the shelves when we need to look something up, happy to have them at our fingertips for reference; I suspect few of us think about how they came to be. 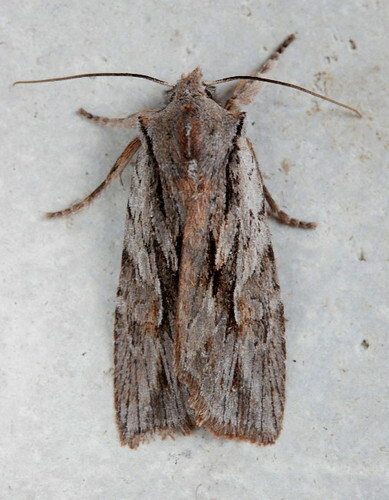 The start of the new mothing season is a little like the return of the first migrant birds. Even the common species can cause a thrill when the first one shows up – the recognition of a familiar face, an old friend. The opening photo of a Lettered Sphinx, and the above, a Dogwood Thyatirid, are two of the familiar faces I look forward to in spring. 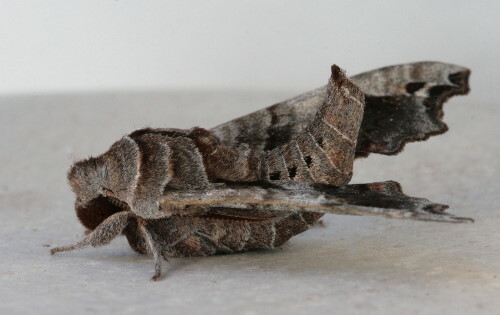 The Lettered Sphinx was the first sphinx moth I ever saw, and at first I didn’t realize it was a sphinx – I’d been expecting something a lot larger! They do say you never forget your first, don’t they? 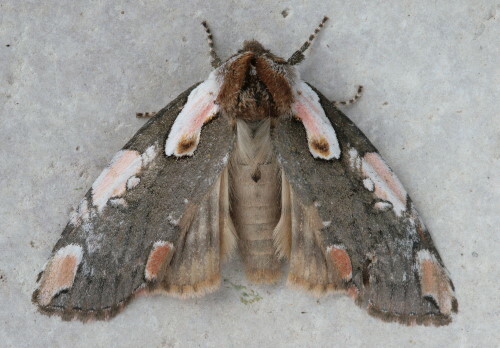 I got this Fawn Sallow last spring, on April Fool’s Day. I love all these fuzzy-bodied sallows, spring fliers most of them, but the Fawn Sallow might have the thickest mane of all of them. This was the first (and only, so far) individual of this species I’d encountered. I love that about mothing: you never know what might come in to your light at a given night or location, and there’s a pretty good chance you’ll find something new to you, even many years on. I’m not many years on yet (this will be only my fourth full season), so I’m still getting lots of new species each year. And while the new-to-yous are pretty exciting, stuff like this is even more so. This Cedar Pinion came to my light while I was staying over at my mom‘s last year. The species is exceptionally rare in the northeast, I discovered; it’s not mentioned in the (admittedly 20-year-old) Ontario checklist, and was mentioned in passing in the (12-year-old) Quebec guide. On BugGuide and Moth Photographer’s Group there are only two other live-specimen photos besides my own. A bit of a thrill to discover something like that. Like being the person to discover a vagrant western bird species here in the east. And then there are the species that you never get tired of looking at, no matter how many might come to your light. Like this Lettered Habrosyne. I got my first Habrosyne a couple of years ago, at the lake house. I’ve caught several more since then, but each one is a delight. I mean, just look at that patterning. How can you resist? And finally, the species that you saw once, long ago, and keep hoping you might get to see again. 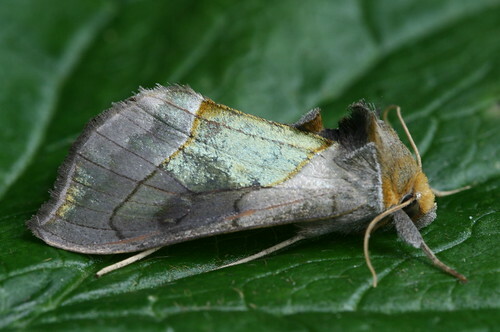 This is an aptly-named Hologram Moth, with an amazing iridescent green patch in the middle of its back. 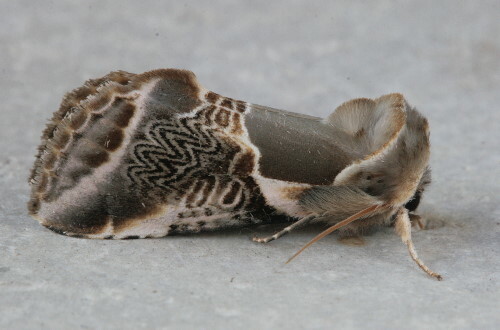 The first and only one I’ve ever got was caught at my parents’ old house, in my first full season of mothing in 2008. Despite the fact that it’s a northern species, found throughout Ontario, I’m still waiting for another. 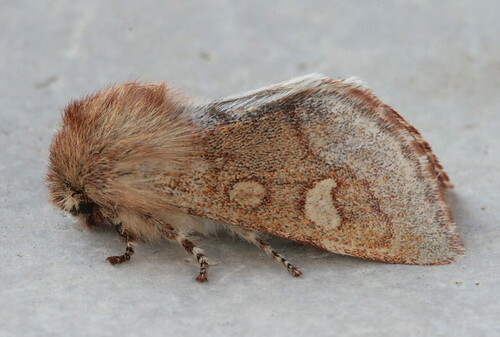 But that’s the wonderful thing about mothing: there’s always this year, and you never know what might turn up. Wish we were able to work faster, Barbara! I’m really looking forward to it being out, too. I know a lot of people are anticipating it. Beautiful photos! have also had moths on the brain in the worst way. I just finished the very wonderful book, ‘Discovering Moths’ and now I’ve become quite obsessed. Which is rather unfortunate since it’s the middle of winter! I’ve always been interested in moths, but now I’m a full convert and I’m eagerly waiting until spring to see what I can find. I’m absolutely in love with their variety. I’ve been meaning to read that for a while, Kelly, but still haven’t gotten to it. Sounds like it was a good read, then! appears a loot of it iis popping it up all over the internet without my permission. Do you know any solutions to help protect agvainst content from being stolen? I’d definitely appreciate it.